Energy prices are timely, especially now that Libya's Qaddafi has ordered the destruction of some oil pipelines to the Mediterranean. Libya produces some 1.9 million barrels of oil per day, or about 2.2% of world oil consumption. That's not a huge amount, but if Libyan supplies are cut off it could prove difficult for Europe and it could contribute to higher world prices, and prices have already jumped 10% since last Friday in anticipation. These charts help put things in perspective. 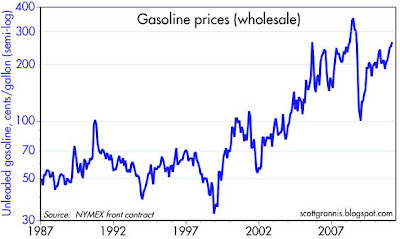 Oil and gasoline prices are closing in on their 2008 highs, but still have a ways to go—it will take another 40-50% before we see new all-time highs. 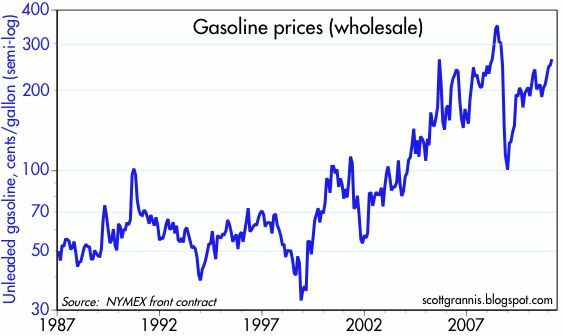 Gasoline prices in the U.S. are running a bit ahead of crude prices, as suggested in the third chart, but not by that much. The big question is whether prices are or will soon be high enough to shut down the global economy. I don't think this is an immediate concern. In real terms, energy prices are still well below their previous highs, and the U.S. economy is still on a trend whereby it consumes less energy per unit of output ever year. In real terms, the U.S. consumer spends much less of his/her income—about 30% less—on energy today than in the early 1980s, even though real oil prices today are about 10% higher than they were in 1981. Higher oil prices would be more problematic if the Fed were tightening monetary policy to keep inflation. As it stands, the Fed is quite accommodative, which means they are supplying enough money to accommodate most or all of the rise in oil prices. If the Fed weren't so accommodative, then higher oil prices would be much more painful because they would require that other prices decline by an equal amount. I don't know I can have an argument with Scott Grannis when he keeps agreeing with me. What next? Endorsement of QE3? "Higher oil prices would be more problematic if the Fed were tightening monetary policy to keep inflation. As it stands, the Fed is quite accommodative, which means they are supplying enough money to accommodate most or all of the rise in oil prices. If the Fed weren't so accommodative, then higher oil prices would be much more painful because they would require that other prices decline by an equal amount." But I think this time is different. The previous spike (2008) has undercut demand. Crude oil demand has not been growing for a long time, and may start falling again soon. I was browsing through your blog scottgrannis.blogspot.com and found very interesting contents on money and finance which are pretty informative. I was hoping I could write a guest post on your blog with an article related to your blog, I believe this will be of interest to your readers. Well problem is the Fed was EXTREMELY accommodating from Oct 2007 on yet it didnt stop oil prices of $100 plus contributing to the economic downturn that began in Dec 2007. The same argument was made back in 2005-07. 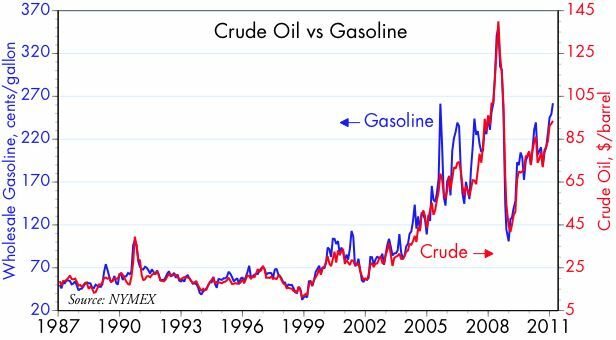 Rising oil prices wont derail the economy because the price rise was caused by increased demand and strong growth, not by a supply shock ala 1973 and 1979. Turnout that wasnt true at all. Even high prices caused by demand increases and growth eventually undermine that growth. Also the Fed wasnt being restrictive during this period. In fact one could argue that high oil prices in USD were in part caused by the Fed being too accommodative. Oil prices in USD rose much faster than oil priced in Euros between 2001 and 2007. 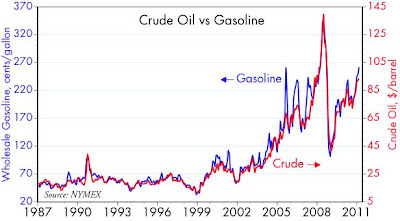 The final and largest spike in oil prices came in late 2007 into summer 2008 once the Fed eased in Oct 2007. Sounds like you will miss the boat again on the oil impact. 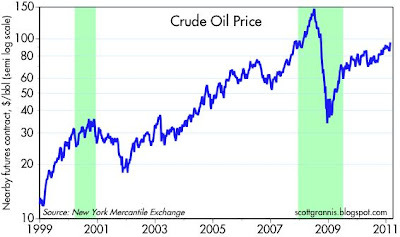 Plenty believe oil was the nail in the coffin in 2007/08. You can wish away oil not acting as the lubricant to the global economy but it won't change the facts on the ground. Printing more dollars is only going to make this situation worse. "Higher oil prices would be more problematic if the Fed were tightening monetary policy to keep inflation. As it stands, the Fed is quite accommodative, which means they are supplying enough money to accommodate most or all of the rise in oil prices." Scott, what are you talking about? This seems rather odd. Could you explain how the Fed handing free dollars to the primary dealers, which then sits idly in reserves, will assist consumers in bearing the burden of higher energy prices for their cars and homes? I would truly like to understand the transmission mechanism you are referring to. Thanks. The Fed is supplying more than enough reserves to accommodate the system's demand for funds. So far banks have preferred to hold the reserves instead of making more loans. But if the economy needs more money to handle the higher price of energy, then the money is there (in the form of reserves) for the taking. The Fed is keeping the price of money very low in order to ensure that the economy has no shortage of money. Suppose all prices doubled tomorrow. If the Fed didn't take steps to greatly increase the supply of money, then a severe shortage of money would develop and prices would eventually decline. If just oil prices rise, but the amount of money doesn't change, then some other prices would have to fall. In order for the general price level to rise permanently, there has to be a corresponding increase in the supply of money (or else there must be a corresponding decline in the demand for money). The Fed is permanently raising the general price level every year it places money irrespective of supply and demand. This is why your grandfathers 5 cent hamburger costs 2,000% more today even though it takes significantly less units of labor and capital to produce it. Take a long hard look at Japan. Asset values have been falling for 20+ years. Wages have been falling for 20 years. The yen is very strong. Even adjusted for per capita, Japan's GDP growth is feeble next to the USA's. Japan has had no inflation, and some deflation, for 20 years, and investors expect at least another eight years of deflation. Maybe someday Japan will be to have a tight money supply and vigorous economic growth. Howqever, the Japan lesson seems to be you cannot have vigorus economic grwoth and a tight money supply. As for me, I do not want to wade through 30 years or recession-deflation to find out if tight money will ultimately work. I can live with some inflation. Anything under 4 percent is okay with me. I like prosperity and real growth. If Shaquille O'Neil's mother, (or for that matter, any professional basketball players mother) , would have never constantly adjusted for her son's growth in his shoe size, he would have never become the success he has become. Hey, Japan used to bind women's feet. So, it's easy to see why they would do the same to their economy. With the same poor results , I might add. You can conduct commerce with any amount of money in the system. The only thing needing adjusting are prices. We did it for thousands of years and economies grew. You have a 100 year old fiat system that collapsed twice in that span. Scott nice blog. You mind me asking what charting software you use? I do my charts with Deltagraph on a Mac, but it also comes in a Windows version.